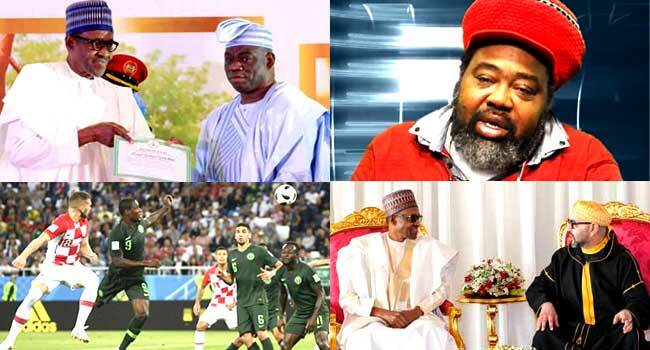 The major happenings from Sunday to Saturday include the commemoration of June 12, the kick off of the 2018 World Cup in Russia, as well as the Eid-el-Fitr celebration. President Muhammadu Buhari proceeded on a two-day working visit to Morocco. The President left Abuja on Sunday afternoon arrived in the country several hours after his departure. Back in the country, the sad news of the death of popular reggae artiste, Ras Kimono, threw Nigerians into mourning. A close family source confirmed to Channels Television that the reggae music icon died on Sunday at a hospital in Ikoyi, Lagos after he slumped the previous day. Barely an hour after the news broke, Nigerians and key players in the music industry paid tributes to Ras Kimono, as well as sympathised with his family. Meanwhile, President Buhari’s declaration of June 12 as Nigeria’s new democracy continued to generate mixed reactions, the latest one coming from MKO Abiola’s opponent in the 1993 presidential election, Bashir Tofa. Mr Tofa, who contested the poll on the platform of the defunct National Republican Convention (NRC), questioned the propriety of the President’s decision. But a human rights lawyer and Senior Advocate of Nigeria, Femi Falana, had a different opinion about the issues. The lawyer believed the decision was a starting point for the government and would do justice to Nigeria’s history. The governments of Nigeria and Morocco agreed on a cooperation plan to press on with a proposed pipeline transporting gas to the North African kingdom along the Atlantic coast. The signing of the agreement was supervised by President Buhari and King Mohammed VI of Morocco in Rabat. 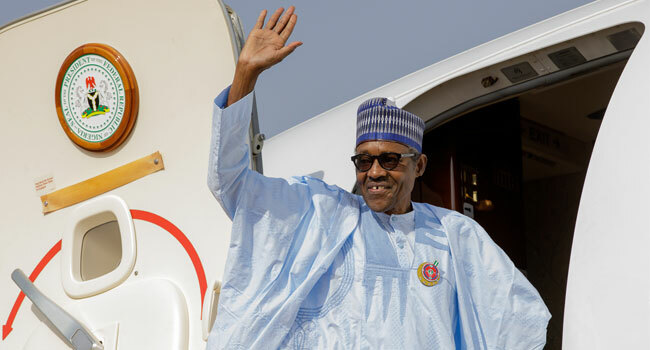 President Buhari, who travelled to Morocco at the invitation of King Mohammed VI, returned to Abuja on Monday evening. 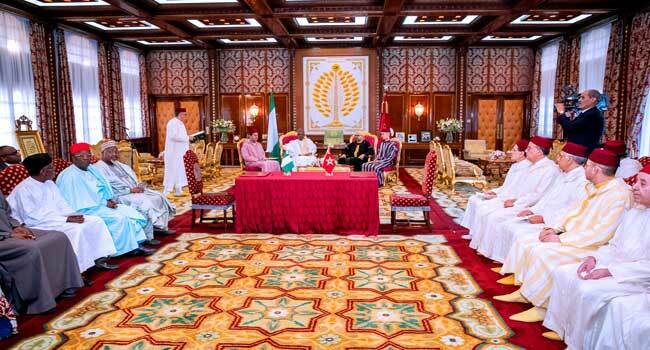 President Muhammadu Buhari and top Nigerian government officials at the royal palace of the King of Morocco. Elsewhere, Vice President Yemi Osinbajo called on oil-producing countries in Africa to think of a world beyond oil. Professor Osinbajo stressed the need to redouble efforts at using oil and gas revenues to pursue diversification, investment in infrastructure and human capital which he noted would ensure future economic growth and development of such nations. In the entertainment world, the Federal Government joined Nigerians to mourn Ras Kimono. In a statement, the Minister of Information and Culture, Mr Lai Mohammed, said the legacy of the reggae star would surely endure. In Kogi State, the trial of the lawmaker representing Kogi West in the National Assembly, Senator Dino Melaye, and two others in the case of alleged illegal possession of firearms continued in Lokoja. The two prime suspects, Kabiru Seidu and Nuhu Salihu, as well as Senator Melaye, all pleaded not guilty to the charges when they were arraigned at a Senior Magistrate Court in Lokoja. Tuesday last week was June 12 and was celebrated across the country in a more significant way. The significance of the day was the conduct of the 1993 presidential election which was widely accepted as the freest and fairest in Nigeria’s democratic history. 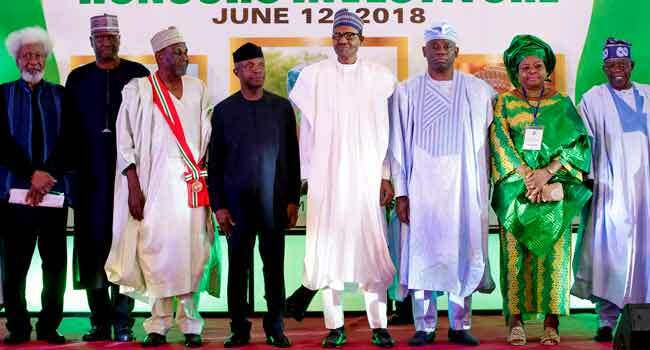 President Muhammadu Buhari with Professor Wole Soyinka, SGF Boss Mustapha, Award Recipient Ambassador Baba Gana Kingibe (GCON), Vice president Yemi Osinbajo, Son of MKO Abiola (Kola), Wife of Gani Fawehinmi (Mrs Ganiyat), and Former Governor Bola Tinubu at the Special National Honours Investiture at the State House Conference Centre on June 12, 2018. Commemorating the day with Nigerians, President Buhari formally conferred the highest national honour of Grand Commander of the Federal Republic (GCFR) on Abiola – the presumed winner of the poll. Thereafter, he apologised to the Abiola family and others who lost their loved ones to the June 12 struggle. The President said, “On behalf of the Federal Government, I tender the nation’s apology to the family of late MKO Abiola, who got the highest vote [in the election], and to those that lost their loved ones in the course of the June 12 struggle.” In his response, Nobel Laureate Professor Wole Soyinka said the apology was accepted on behalf of the Nigerian people. He, however, asked the President to stop showing loyalty to the supposed tormentor of late MKO Abiola. Elsewhere in the nation’s capital, the FCT High Court sitting in Gudu sentenced a former Plateau State Governor, Joshua Dariye, to 14 years in prison. Mr Dariye was sentenced to two years for criminal misappropriation, as well as 14 years for criminal breach of trust. The Presidency informed Nigerians that President Buhari would sign the 2018 budget this week. The Special Adviser to the President on Media and Publicity, Femi Adesina, disclosed this to reporters at the end of the Federal Executive Council meeting held at the Presidential Villa. On legal matters, a Federal High Court in Abuja ordered the immediate dismissal of the senator representing Kogi East, Mr Atai Aidoko. The court presided over by Justice Gabriel Kolawole, held that Aidoko was wrongly presented as the flag bearer of the Peoples Democratic Party (PDP) in the December 2014 primary conducted by the party. Also, a Federal High Court sitting in Katsina adjourned the trial of the former state governor, Ibrahim Shema, till October 15 and 16. The prosecution counsel, Sam Ologunorisa, explained that this followed an application filed by the defendant seeking to quash the charges levelled against him. Meanwhile, a court ordered that Mr Peter Nielsen, the Danish man who allegedly killed his wife and daughter, remained in prison custody and fixed October for the commencement of his trial. The Lagos High Court sitting in the Igbosere gave the order following Nielsen’s arraignment by the Lagos State government. President Buhari stressed the importance of deepening relationship with other nations for the development of a country. Receiving the outgoing ambassadors of the Federal Democratic Republic of Ethiopia and the Republic of Turkey, The President noted that such relationship was important for his administration to achieve its desired goals. 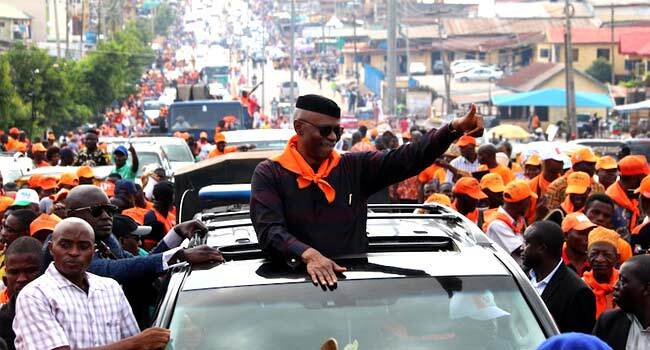 In the South-west, the immediate past governor of Ondo State, Dr Olusegun Mimiko, dumped the PDP for the Labour Party. File photo: Former Governor Olusegun Mimiko during a rally of the Labour Party held in Ondo State on June 14, 2018. Mimiko revealed this in his letter of resignation to the PDP leadership in the state, informing them of his decision to leave the party. He was later presented a membership card of the Labour Party by the party leadership in the state amid cheers from supporters at his ward in Ondo town. But the former governor’s return to the party triggered mixed reactions between the two factions of the party’s national leadership. In Zamfara State, the police confirmed the death of at least 10 people in raids by suspected cattle rustlers on four remote villages in the state. Residents of the affected community said the armed bandits stormed the villages in Birnin Magaji area of Zamfara, in an apparent reprisal after local militia killed one of their members. Meanwhile, the Economic and Financial Crimes Commission (EFCC) replied those criticising the agency’s anti-corruption fight. The EFCC spokesman, Wilson Uwujaren, said the commission has been vindicated by the convictions of two former governors and prominent members of the ruling All Progressives Congress (APC), Jolly Nyame and Joshua Dariye, by a Federal Capital Territory High Court. Nigerian Muslims joined their counterparts across the world to celebrate Eid-El-Fitr, the festival marking the end of the month-long Ramadan fast. The Muslim faithful thronged praying grounds across the country to offer thanks to God for the successful completion of the fast. President Muhammadu Buhari praying at the Mabilla Barracks, Asokoro in Abuja on Friday, June 15, 2018. In his Salah message, President Buhari called on Nigerians to forgive one another and embrace peace. He also emphasised the need to put the virtues of Islam into practice beyond the fasting season. The President further revealed that participating in the 2018 Ramadan Fast has improved his health and made him more fit to handle national issues. He, however, appealed to ordinary Nigerians to ‘stop glorifying thieves’ by treating them with disdain for bringing hardships to others. President Buhari assured them that the Federal Government would ensure that the challenges the nation is facing do not last forever. 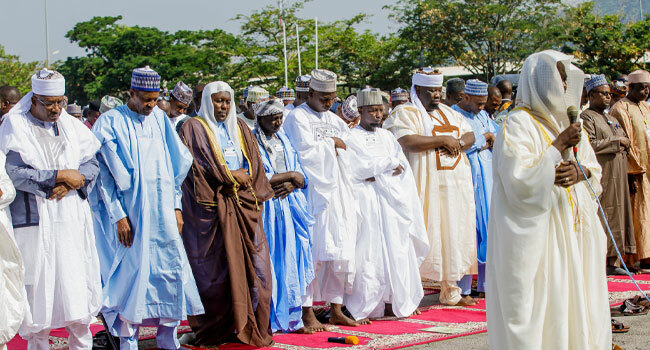 In their separate messages to the nation, the Senate President, Dr Bukola Saraki, and Speaker of the House of Representatives, Honourable Yakubu Dogara, called for sustained prayers for peace in the country. In an exclusive interview with Question Time, Kola Abiola, the eldest son of late MKO, explained how his attempts to get former President Goodluck Jonathan to honour his father were unsuccessful. Kola revealed that he contacted the then Attorney-General of the Federation, Mohammed Adoke, and others he believed had access to the former president but the issue was politicised. In another interview on Hard Copy, the former Secretary to the Government of the Federation, Mr Babachir Lawal, said he was happy with the EFCC’s investigations into allegations of corruption against him. The Local Government Area (LGA) elections in Rivers State held as scheduled across the 23 council areas of the state. 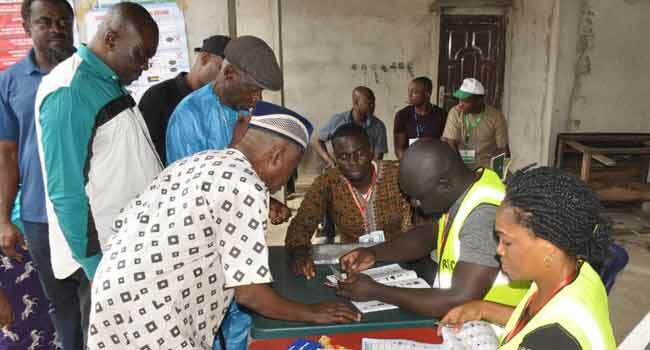 The exercise commenced early in Khana – one of the LGAs visited by Channels Television crew, as electoral materials were distributed at the Police Station Field in Bori community. Despite being relieved of his duties as the SGF, Mr Lawal insisted that President Buhari’s decision to fire him has not affected their relationship. He noted that he can see the President anytime he wanted to, adding that he joined politics to contribute to support Mr Buhari’s presidential ambition. In the North-east, at least two persons were killed and several others injured in a heavy windstorm in Bauchi State. The windstorm, which lasted for more than an hour, damaged several houses – blowing off roofs and destroying fences in Bauchi metropolis and beyond. 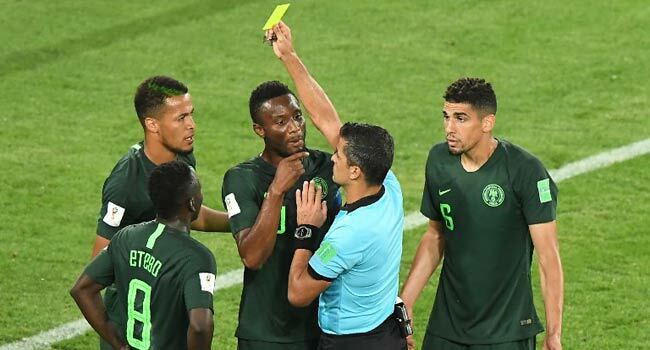 Away in Russia, Nigeria kicked off their World Cup campaign with a loss to Croatia. A Luka Modric penalty and an own goal from Oghekaro Etebo gave the former semi-finalists a 2-0 win over the Super Eagles in their Group D opener. With rivals Argentina and Iceland only managing a 1-1 draw earlier Saturday in Saransk, both sides had a chance to take control of Group D.